Managing Human Resources 8 Edition NOTE: You are purchasing a standalone product; MyManagementLab does not come packaged with this content. If you would like to purchase both the physical text and MyManagementLab search for 0133254127 / 9780133254129 Managing Human Resources Plus MyManagementLab with Pearson eText -- Access Card Package, 8/e Package consists of: 0133029697/ 9780133029697 Managing Human Resources, 8/e 013386703X/9780133867039 MyManagementLab with Pearson eText -- Access Card -- for International Business: The Challenges of Globalization, 8/e MyManagementLab should only be purchased when required by an instructor. For undergraduate or graduate level human resource management courses. Prepare future managers with an understanding of HR skills. 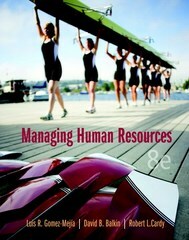 Managing Human Resources gives future managers a solid business understanding of human resource management skills. The approach used in this text makes human resources relevant to anyone who has to deal with HR issues in the workplace, even those who do not hold the title of manager. The Eighth Edition is updated to include new introductory vignettes, new case studies, and a focus on emerging trends in HR.